Harry Reid may be on a mad dash to bring the radical Liebmerman/Collins/Rockefeller cybersecurity bill, but a broad spectrum of Republicans continue to fight. Democrats may have toned down its Internet Kill Switch provisions, but still is a massive power grab online, and the new SECURE IT act is a much better idea. What I absolutely love about SECURE it is that it hits all the key points: It strengthens criminal penalties for breaking into servers. It strengthens criminal penalties for breaking into servers (Yes, I said that twice on purpose because it’s that important). It creates private sector information sharing incentives without regulating the private sector at large. It turns inward and gets government to audit its own practices. It tells you just how basic and correct this bill is when it has co-sponsorship from such a broad spectrum of the caucus: Ron Johnson as mentioned, John McCain, Kay Bailey Hutchison, Chuck Grassley, Saxby Chambliss, Lisa Murkowski, Dan Coats, and Richard Burr. Support Ron Johnson and the team. We want this bill passed. The common-sense alternative to the power grab cybersecurity bill. Even extreme libertarians are cautious about the bill instead of strongly opposed, which I think we all can see is a big deal for a bill about strengthening national security. So it’s no wonder Harry Reid is promising to give the bill a fair chance. This could be the one that passes, especially if Greg Walden’s new House cybersecurity efforts make it clear that this is the one that can get through both chambers and to the President. Criminal enforcement does matter. Why else would Anonymous online terrorists attack the Interpol webpage after an Interpol-led effort rolled up a 25-man Anonymous cell? When we arrest them and jail them, it hurts them. We need to do this more, and we need to make sure the penalties sting. PATENT WARS: Well, again, this time it’s trademark wars. Apple is going after the EPAD in China after having won the iPad battle. Why would we be in a rush to raise taxes on Facebook, an innovator and driver of job creation in this economy? Don’t believe me that they create jobs? Just look at Zynga and all the other companies around that exist because of Facebook and its popularity? Should we have a whole FCC blackout regulation in place solely as a gift to major sports leagues that make billions of dollars? Probably not. Kim Dotcom claims he’s as innocent as Saddam Hussein in defending his since-raided Megaupload operation. Look, the DMCA model of working with copyright holders is a reasonable one. If he wasn’t doing it, then he had it coming. Thanks to George Soros, Public Knowledge, Gigi Sohn, and the rest of the anti-AT&T/T-Mobile team, AT&T is now having to stab we (as I’m one) unlimited data plan holders with throttling and caps. Lack of spectrum hurts, kids. And yet some of these people are going to complain that AT&T is doing what it has to after being the target of a team effort by Barack Obama and George Soros. And they’re going to target AT&T’s next plan, too which is very simple one. AT&T would like to give wireless App developers he opportunity to subsidize data use by their apps, calling it the ‘800 number model’ applied to mobile data. Some people are scared to death of this, because competition could force some data-heavy services to consider data costs when designing their apps. But it’s a great, innovative, market-based way to help people on metered data plans manage their use. Government shouldn’t interfere. Some say we need a national sales tax compact to keep states from having to raise other taxes as the sales tax model breaks down. I’m not sure if it’s a bad thing to just have a smaller, simpler tax code, but it’s a fair point to consider. Some states may overreact, using the sales tax situation as cover for raising revenue. 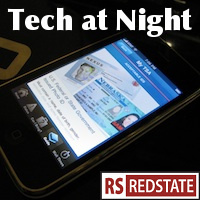 Tech at Night continues to be on a shifted schedule this week thanks to my being detained last Friday and Monday.